Rafael Nadal will have to wait until Tuesday to wrap up his unexpectedly tight match against lucky loser Simone Bolelli, as Monday night’s play in Paris was suspended due to thunderstorms. 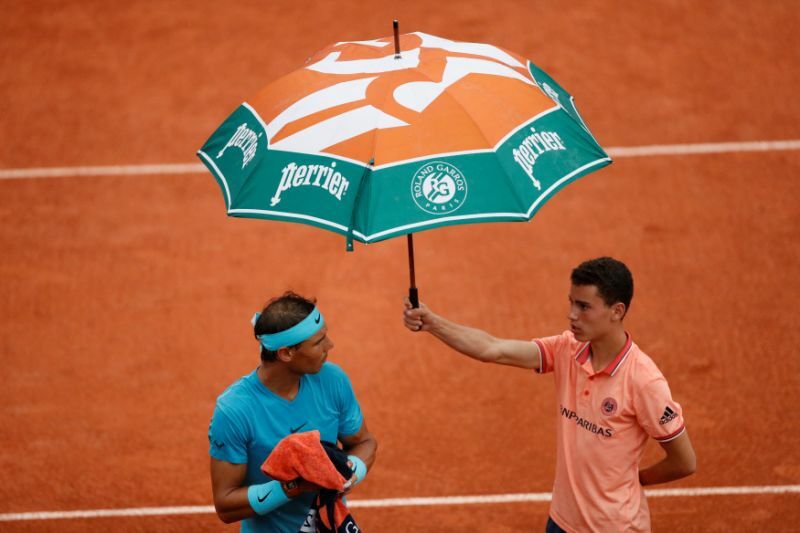 Spain’s Nadal, a 10-time French Open champion, had won the first two sets 6-4 and 6-3, but Italy’s Bolelli was up 3-0 on Nadal in the third set before the match was postponed around 8 p.m. at Philippe Chatrier court. Simone Bolelli and Fabio Fognini defeated Ben McLachlan and Yasutaka Uchiyama in Saturday's doubles as Italy took a 2-1 lead over Japan in the first round of the Davis Cup. After splitting Friday's opening singles, Italy gained the advantage after a 7-5, 6-7 (4), 7-6 (3), 7-5 doubles victory. The winning country advances to the quarterfinals while the loser will have to win a playoff to remain in next year's World Group. 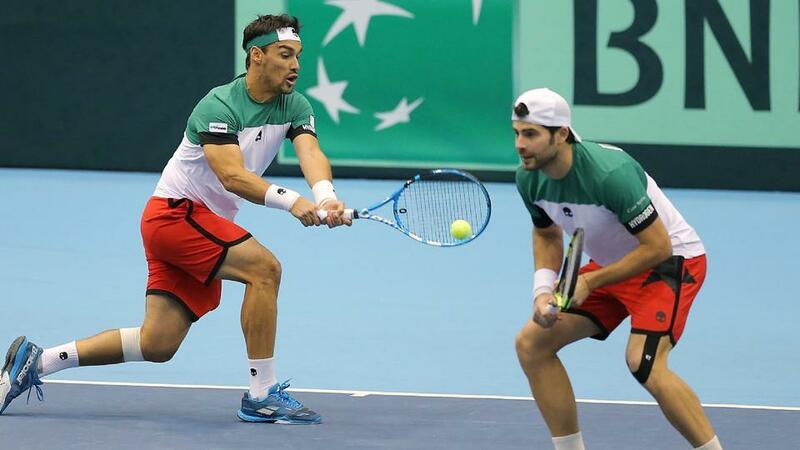 Fabio Fognini and Simone Bolelli defeated the Kazakh duo of Andrei Golubev and Alexander Nedovesov in doubles on Saturday to give their team a 2-1 lead in their Davis Cup first-round meeting. Fognini and Bolelli, who was a replacement for the originally nominated Paolo Lorenzi, lost a marathon tiebreaker in the third set but recovered to close out the match 7-6 (4), 6-3, 6-7 (13), 6-4. The Kazakhs played higher-risk tennis, edging the Italians 51-47 on winners but posting 74 unforced errors during the match, 27 more than Fognini and Bolelli. Rafael Nadal scored a 6-2, 6-2, 6-1 victory over Simone Bolelli in his opening match at the 2012 French Open tennis tournament where he is the defending champion. Rafa made only 18 unforced errors, fewer than half as many as his opponent. The Spaniard won the French Open six times. Bjorn Borg is the only other man with six titles at Roland Garros. Nadal broke for a 4-2 lead in the first set which he won in 35 minutes. In the second set he claimed 4-0 lead before Bolelli broke him for 4-1. The Italian held to close the gap and even had 3 break points for 4-3 but rafa saved them and then had no further problems to seal a two set to love lead. Nadal went up 3-0 in the third as Bolelli was unable to spot hime. The spaniard broke again for a 5-1 lead and held to take the win. Juan Martin Del Potro, who got in at at the Masters Guinot Mary Cohr after Gael Monfils pulled out, suffered a shock defeat before Roland Garros. Delpo lost 7-6 6-4 to Simone Bolelli, ranked 111th in the ATP rankings. The Argentine is still feeling pain on his knee and is trying to get better as soon as he can to be ready for the upcoming French Open. Paul-Henri Mathieu scored 6-1 6-3 win over Kevin Anderson while Michael Llodra beat Alexandr Dolgopolov 6-1 6-4. Mathieu has been granted a wild card for Roland Garros because he spent a long time out of the courts due to injury. Andy Murray is also playing this exhibition tournament but he will take the court on Thursday when he faces Ernests Gulbis. Milos Raonic has withdrawn and will be replaced by Vasek Pospisil, who will meet Fernando Verdasco. Rafael Nadal launched his 2010 Qatar ExxonMobil Open campaign with a 6-3 6-3 victory over Simone Bolelli in Doha. In the second round the world number 2 will play against Potito Starace. Bolelli was broken twice in the first set and once in the second by Nadal, who closed the match out with an ace. "I tried my best there. I gave 100% in the match," said Nadal. "I got good practice in Abu Dhabi and that gave me good rhythm for this match. Bolelli plays good shots so this was a tough match." he added. It was a good match for Nadal but it also contained some uncertain moments when he was 15-40 down in his opening service game, and 30-40 down on his serve in the sixth game. But Nadal had averted all three potential setbacks and with his forehand, he became more confident. A turning point came after Bolelli missed a point to reach 4-3, then delivering a contentious double fault to drop serve for the first time. Nadal then consolidated the break by holding serve for 5-3 and broke again in the next game to grab the set. Nadal´s momentum increasing in the second set. It was a minor surprise that Bolelli held Nadal off till the sixth game before another break came. And Nadal had no problems to close the match and take the win. Roger Federer beat Simone Bolelli 6-3 6-4 6-1 to help Switzerland take a 2-0 lead in their Davis Cup World Group playoff against Italy. Federer said he felt tired before the match after flying back to Europe but it rarely showed. He surrendered a break advantage in the fourth game of the second set with a couple of poor forehands but he regained it in the next game and went on to wrap up the match with ease. Stanislas Wawrinka defeated Andreas Seppi 6-4 6-1 6-2 earlier in the day. Federer is down to join forces with Wawrinka on Saturday for the doubles match against Fabio Fognini and Potito Starace. Simone Bolelli will be part of the Italian Davis Cup team that will play the playoff against Switzerland. Roger Federer is expected to play for Switzerland in the Sept. 18-20 contest on red clay courts in Genoa. Bolelli was suspended by the Italian tennis federation in September 2008 for skipping a tie against Latvia. He said he told Italy captain Corrado Barrazzutti well in advance of the tie that he preferred to work on his fast-court game in Asia. The federation revoked the ban in July. Fabio Fognini, Andreas Seppi and Potito Starace were also named to Italy’s team for the World Group playoff. Nikolay Davydenko scored a 7-6 (10), 6-1 win over Simone Bolelli to reach the semis at the Croatian Open. The Russian needed to save five set points in the opening set. Bolelli had two set points at 6-5 and three more in the tiebreaker. It was Davydenko’s eighth singles win in a row after taking the German Open title last weekend. Juan Carlos Ferrero beat Maximo Gonzalez, 7-5, 6-2 to set up a semifinal against Andreas Seppi, who ousted Nicolas Massu 6-4, 6-4. Novak Djokovic beat Simone Bolelli 7-5, 6-2 to reach the second round of the Gerry Weber Open while Jo-Wilfried Tsonga also advanced after defeating Fabrice Santoro 7-5, 6-2. Djokovic lost his footing several times on the slippery grass. In the final game of the opening set, the Serb fell on his backside as he tried to reach a shot. He still produced a winner that gave him a set point. Bolelli fended it off, before giving up another and then sending a backhand into the net. Djokovic dominated the second set. "He was going for his shots and I knew he had a big forehand. But he was struggling to hold serve and I took the opportunity," Djokovic said. "I was playing quite well for a first match. Those first matches in a tournament are always difficult," Djokovic said. "I am coming from clay, where you slide a lot and have long rallies and you have to adjust on grass. I have to work on my movement." Tsonga's match against his fellow Frenchman also produced some acrobatics. Tsonga at one point dived for a ball and had to throw his racket to make the return. Tsonga rolled over, picked up the racket, rushed to the forehand side and continued the rally. He then raced back to the backhand side and tried to hit a winner down the line that was just wide. In the end, Tsonga just had too much athleticism for Santoro, who is retiring at the end of the season. "He served very well, he put me under pressure and he moved very well," Santoro said. "I didn't have a break point. I didn't do anything wrong, but nothing exceptional either." Andy Murray, the defending champion, defeated Simone Bolelli 7-6 6-4 at the Madrid Open. To win Murray had to overcome some weird and not-so-wonderful bounces on the clay, plus clattering over a sign and bashing his knee against the umpire's chair, the belief that most of the net-cords fell in Bolelli's favour, and a line-call on his set point that left him so astonished that he stood there with his hand covering his mouth. The Scott saved a couple of set points in the first set tiebreak and reached the third round where he will next play Tommy Robredo. There was not much between Murray and Bolelli during the match, and the Briton was pleased at going through in straight sets. Madrid is around 650 metres above sea-level, so the ball was always going to be flying more than at most tournaments, and Bolelli was not afraid to go for his shots, hitting plenty of forehands that fizzed through the thin air. Murray felt as though Bolelli did the best out of the net-cords, as there were a few occasions when the ball hit the tape and dribbled over for a winner. When Murray had his first set point in the tiebreak at 6-4, he hit a first serve out wide and believed it had been a clean ace. But the official came down from his chair, looked at the mark and called the serve 'out'. Murray double-faulted, firing his second serve long. Bolelli saved another set-point, and when the players changed ends at 6-6, Murray immediately did his own inspection of the mark, and could not believe that the umpire had judged the ball to have landed in the tramlines, which led to that hand-on-mouth gesture. Murray had to stave off two of Bolelli's set points before he converted his fourth set point, winning the tie break 11-9. 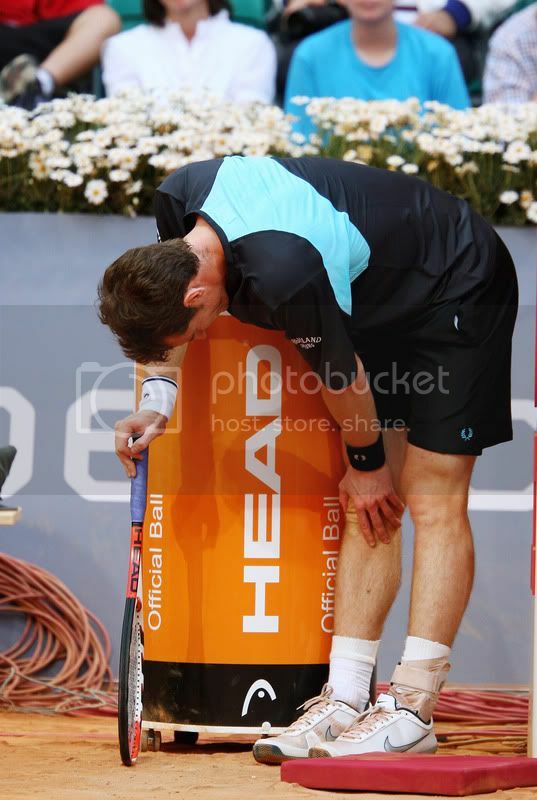 And not everything went Murray's way in the second set either but he managed to get a break to take the victory. "I was very, very sure that the serve was in on that set point, and I was even more certain when I went to look at the mark, and that was tough to come back from," said Murray. Philipp Kohlschreiber and Simone Bolelli advanced to the second round of the Monte Carlo Masters. Kohlschreiber beat Ernests Gulbis 6-1, 6-3 and will face Fernando Verdasco next while Bolelli defeated Robin Soderling 6-4, 1-6, 6-3. Bolelli broke Soderling in the fourth game of the third set and then held for a 4-1 lead. He clinched the match with an ace on his second match point and next faces either ninth-seeded Gael Monfils of France or Janko Tipsarevic of Serbia. Janko Tipsarevic, 7th seed, and Wayne Odesnik put on a show for the crowd in the feature match of the night. In the opening set Tipsarevic fought off one set point and pushed the match to a tiebreaker. After missing out on closing his own first set opportunity at 6-5 in the breaker, the next point Tipsarevic broke Odesnik and then served an ace to claim the opening set 7-6 (8-6). The Serb appeared to be on the way to an easy second set leading 4-2 before Odesnik charged back. With his hometown crowd behind the him, Odesnik tied the set at 5-5, but was unable to maintain the rally and fell to the tournament's seventh seed 7-5. Simone Bolelli, 5th seed, defeated Christophe Rochus 6-2 6-4 to advance to the 2nd round. The Italian fired 10 aces and was challenged only twice with break points and held on both times. Arnaud Clement scored a 6-2 6-2 win over Diego Junqueira in just 1 hour of play. Clement controlled the flow of the match winning 70% of his service points, with five of the points coming on aces in the first-ever meeting between the two. Stefan Koubek and Yen-Hsun Lu played a match filled with momentum swings. The Austrian jumped out to a 5-2 first set lead only to see Lu rally back and force a tiebreaker. Lu quickly moved out to a 5-0 lead in the breaker before Koubek turned the tables and rallied for a 10-8 win claiming the first set. Lu rebounded quickly to take the second set 6-1, but Koubek pulled it together and held on to win the final set 6-3 and advance to the second round. Marc Gicquel beat Sergiy Stakhovsky 6-2 6-3 and also made it to the second round. Today we also enjoyed some doubles action where Paul Hanley and Stephen Huss ( Former Wimbledon doubles champion), seeded third, needed to battle very hard to be able to make it past Evgeny Korolev and Steve Darcis 7-5, 7-5. After the exiting night match between Tipsarevic and Odesnik, another doubles match took the dourt. Ashley Fisher and Scott Lipsky defeated Rik De Voest and David Martin 6-3, 6-4. "I really didn't want to lose... I fought a lot and I was determined."